If Andy Lees isn’t the guy charged with saving Microsoft, he’s certainly in the top three. As president of the company’s Windows Phone division, Lees is working to extend Microsoft’s desktop hegemony to a realm where it doesn’t yet exist: mobile. With Windows Phone 7, Lees is looking to create a third mobile ecosystem that is a viable alternative to Google’s Android operating system and Apple’s iOS. Key to the success of that effort: Winning users in big developing markets like Asia. 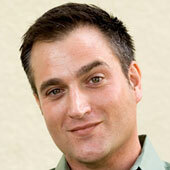 Ina Fried: So, yeah, you guys have been out with Windows Phone 7 about a year now. Ina Fried: The new version just came out. Still not seeing a lot of these phones, so where are you with kind of the effort to get yourselves back in the phone business? Andy Lees: Well, obviously, we launched V1 and our main objective with V1 was to go out and have a whole new point of view, and a people-centric point of view, in our user experience. We felt we achieved that. There were a few gaps in terms of functionality. And so, less than a year later, we have 7.5, or Codename Mango. And I think that’s been critically acclaimed as filling those gaps and leapfrogging the competition in many areas. We’re just in that position at the moment where we’re waiting for new phones to come out, and so new phones from Samsung, HTC, and of course one of the things that we did in the last twelve months is our partnership with Nokia. And next week, it’s going to be Nokia World where they’re going to announce their phones and how they’re going to really take, make the most out of the Windows Phone opportunity. Ina Fried: Now in the last couple of weeks, we’ve seen the latest from your competitors, we’ve seen Apple with both the new version of iOS making it to market and the iPhone 4S, I think they sold four million in a weekend. Are you guys selling that many every six months? Andy Lees: Well, we haven’t announced exact numbers, but the, certainly, I think, as our new phones come on, we’re eleven months into market, we sold more in the first twelve months than Android sold in the first twelve months. So, we’re waiting for those new devices to come out and new partnerships to take, and we think that our unit volume will climb from there. Ina Fried: What are the things — you’ve talked about kind of doing the things technologically, to get where you wanted to be, and having done that over the last year, year and a half. What are the things that Microsoft and its partners need to do to get to scale on the phone side, to get a significant share of the business? ’Cause it’s not about getting nice reviews, right? Andy Lees: Well, I mean, getting nice reviews is really important, because if you don’t have something that’s different to everybody else, then how can you go through and expect customers to go and buy? So, I think having a different point of view, different style of user experience, the key things are built in in what we call people centric are important. It’s also important that the partnerships and the commitment from the partnerships, from people like Nokia, who’s going to be investing very, very aggressively, they bet the whole company on the success of their devices running Windows Phone, will be a big accelerant. And so those, as those things come on stream, that will help our overall unit volume and position in the market. Ina Fried: When I talk with developers and a lot of hardware makers, carriers, you know, and ask them, you know, “Who’s number one, number two in the market?” obviously they don’t have a hard time. When I say “Who’s number three in the market?” I get generally the answer, “We’re waiting to see.” When I ask them, “Who’s going to be the third player a year from now, two years from now?” you know, they’re not willing to count out RIM, they’re not willing to guarantee you guys’ll be there. Obviously HP and webOS is no longer there. But, is it concerning to you that a couple years into this effort, people still aren’t ready to even call you guys the serious number three player? Andy Lees: Well, I think if you look at we are twelve months in, or eleven months in to our new effort here. And actually I think the partnerships and the work that we’re doing is starting to be recognized. It was Gartner and IDC, both predicted that we would become number two by 2015. So people are starting to see the stars line up. And I don’t mean to say that’s going to be automatic, we need to earn that position, but I think we’re absolutely putting the right things in place to do that. Ina Fried: How concerning is it to you, I was at the financial analyst meeting at your hardware developer conference, and Steve Ballmer said that, you know, sales haven’t been what they like. I covered Microsoft for seven years, in general when Steve isn’t happy that’s not a good thing. How concerning is it that, you know, as much as you guys have made progress on the technical front, things on the business side haven’t flowed in quite the way that you would’ve liked. Andy Lees: Well, so let’s, let’s look at what we’ve achieved so far in our first twelve months. First of all, the reviews of the product, the customer satisfaction ratings, are very high, much higher than other platforms. Our return rates are very low, our quality is very high. The number of applications that we’ve got, which is a measure of support, has been the fastest adoption of any platform, new platform ever, with over 30,000 applications in eleven months. So all of those things have gone well. The partnership with Nokia is really very important to us because it becomes an accelerant. They still sell an awful lot of phones and we think that we’re going to enable them to continue to grow their unit volume, and turn around their fortunes as we work with them. We also, two weeks ago, signed an agreement with Samsung. A lot of the press around that was really to do with the patents. But actually the other part of the agreement is how we’re going to be investing together from an R&D perspective, and also a sales and marketing perspective. And so you’ll see that ramp up in 2012, as well. HDC has been a strong partnership for Microsoft for a long time, and they’re also ramping up in terms of the number of devices and the sales and marketing that they’re putting in place. And then finally we announced new partnerships with new OEMs that have never shipped Windows products before, like ZTE, Fujitsu, etc. So, those are the things that are the leading indicator as to what’s likely to happen next. You know, when you start out, you start with a level and then these things line up and then you get your unit volume. So, we’ve work to do, but certainly those are better predictors of the future. Ina Fried: One of the theories that I have is that, you know, Windows Phone 7 really strikes me as a very easy, approachable interface for first-time smartphone buyers, but a lot of the people that recommend that first-time smartphone are experienced smartphone users, and they tend to be the Android owners, the iPhone owners. Do you guys think you have a recommender challenge to win those loyalists, so that they’re in your camp when they’re telling their moms, their dads, their friends, their cousins, what to buy? Andy Lees: I think people recommend a little bit of what they use. And so there is a cycle, but — that once you start to use a product, that you’ll then go through and recommend it. And certainly, with the satisfaction ratings that we have, as we build unit volume, I think that as an issue will go away, because our reputation will build with it. I think Android does appeal to a certain type of user. It is very tech based as opposed to being very people based. You know, you’re presented with a grid of icons and a sea of applications; whereas, we present other people in your life, we present things you want to do in your life. The user interfaces, it’s really very, very different. Ina Fried: And one of the things that, if you just look at the numbers, Microsoft was in the phone business before Windows Phone 7, and actually Microsoft’s overall market share has gone down, but part of that has to do with the fact that when Windows Phone 7 shipped a year ago, it actually was in fewer markets than its predecessor, Windows Mobile, had been in. And some of the key markets that you haven’t been in are the ones that we’re in right now, in Asia. That’s starting to change with Mango, right? Andy Lees: Right, so in fact, there’s a number of dimensions to this. There’s the price points, so we are dramatically broadening the set of price points in Mango-related phones, that we can reach, and that’s particularly important because going lower down in price point opens up more addressable market. But the other one is the number of languages, number of countries that we are in. One of the things that we did in Windows Phone 7 is, is the core user experiences are all built into the phone, and it’s people-centric user experience. And so as we go into different countries, it’s important that all of that still works. And we’re announcing today for the first time that we’ll be going into China in 2012. And so, what we’d like to do is show you a demo, where you can see that what we’re doing is not just translating the user experience from English into Mandarin, we want to celebrate things that are unique about the language. So perhaps we can take a look at the demo and see what that looks like. …Derek’s going to help show off this demo. Derek: So we wanted to give you a quick peek of what we’ve been doing, specifically with a new version of Metro, which is our user interface for Windows Phone, that’s been refreshed for East Asian languages, specifically Mandarin today. So, let’s go ahead and switch over to the demo machine. You also notice this is the same familiar Windows Phone start screen. The thing that you’ll notice right off the bat is that we’ve actually taken advantage of local language and local style. So we’re actually taking advantage of vertical text on the top right where we have things like the date. And so we wanted to take the celebration of the local language, the local culture, and actually bring that to the phone, and do it in a way that would be unique. So we’re not actually just porting the user experience, but we’re in fact bringing it around. I can now go ahead and pop into the email experience, which I’m, it’s not so easy to navigate for a native English speaker, but we have here the same email experience that you have on Windows Phone. But again, we’ve add some local touches. So, I can pivot between my unread mails, my high priority, all that stuff is available right here. But the really interesting thing is when we pop into, for instance, this email, you actually know that the name of the person is actually put vertically, as well. And so we again have found the right touches, and we’ve actually touched about 700 different screens in Windows Phone, to make sure that they were customized in this way, to celebrate the East Asian languages. If I were to go ahead and reply on that, you’ll notice that we have all new keyboards, and one of the things the team has been telling us, which I would be challenged to demo, since I don’t speak Mandarin, is that we have an autocomplete system similar to what we’ve had with Windows Phone 7, where it doesn’t just recommend the next letter, but it actually will start to put letters together and suggest groupings of words and popular phrases. And we’re told by the team that because of this, we’ll actually be able to go about two to three times faster than, for instance, on iOS, or on Android, doing text completion with things like Mandarin. Ina Fried: And I’m not an expert either, but my understanding is, you know, as hard as we think it is, you know, in the states and in other western languages to enter text on a software keyboard, it’s that much more of a challenge when it takes multiple keystrokes to enter a character. Derek: That’s exactly right. Now, we wanted to pivot over a little bit and actually show a second demo. And this one is really about how, with Windows 7, we tried to more and more endeavor to have a Microsoft company effort, in terms of the assets that we’re bringing to bear on the phone. And so one of the things we wanted to do is actually show you what the Windows Phone experience looks like, and actually talk through a couple of the scenarios that we’re doing, not just with our own experience, but also with developers and indeed with groups in Microsoft like Xbox. So this is actually the Windows Phone experience now in English, for user care. You’ll actually notice that, like we talked about yesterday, we have these things called “Live Tiles,” this is the different approach that I think Walt was talking about yesterday, where information comes forward and you don’t have to go hunting into them. So, instead of having an application that’s represented by, for instance, a static icon, it actually will tell me things like the weather. My Fourscore app actually has my latest leader board. My “all recipes” app actually shows me the latest recipe of the day. And we even have really convenient ways for developers to write their applications so that components of the app can come to the start screen. So, you’ll actually notice on the bottom left, I have British Airways, and that’s actually my boarding pass. So, unlike other phones where you have to kind of launch the app and find the boarding pass section and find it, we actually use an app shortcut in this case, so that just that part of the application is available to me on the start screen, and I can get to it. Andy Lees: Now what this does, is it sort of shows, we have this people-centric UI, and applications, instead of it just being about silos where you give this grid of icons and sea of applications, they extend the functionality, but they maintain the totality of the system. Which is completely different to other smartphones today. Ina Fried: And I think that’s something that other, you guys kind of were first with, and other folks have been gravitating to. But one of the things that I think, and I think this is the next part of the demo, is that you guys can bring to bear is the company as a whole. And actually, from my way of thinking, Windows Phone is one of the first products from the company that really reached across the company and brought in different parts. Derek: Yeah, one of the things that we really wanted to do is take advantage of assets that we had. So Bing, our search engine; Internet Explorer 9, which is now available not just on the PC but on the phone; and indeed things like Xbox, and have those available across the different screens that you’re using. I’m going to go ahead and fire up one of the Xbox Live games. One of the things that we do with the Windows Phone is that we have a standard set of minimums, so that games indeed work on every single Windows Phone device in a similar way. This is actually a brand new game that has not yet been released, but is coming this holiday, called Kinectimals. And the really interesting thing about Kinectimals, is that it takes off from the experience that is on the console today. So, we have the Kinect, which is actually the fastest-selling consumer electronic item of all time, and then about one in ten of the Kinect users actually have Kinectimals. Ina Fried: So Kinectimals for those who don’t know is a game that’s already on the Xbox, it lets you have your own virtual pet, play with it, etc. And now you’re going to have a phone version. Derek: Exactly. But, what we wanted to do is have a different approach where it’s not just a complete port of the experience that you have on the Xbox, but indeed is a companion experience. And we’ll see more and more of these companions. So, I’m going to go ahead and choose a cub here, I’m going to get a Bengal tiger. Now, the tigers are very friendly, they’re very soft and furry and so what better name for a cub than Walt. So we’ll open that up right here. So this is my cub, named Walt. Ina Fried: I’m sure he’s loving that. Derek: Yes, absolutely. So, we’ll go ahead and load that up. And so the cub will actually load in, and I can start playing with my cub. And so, the whole idea here is that, you know, you got a couple minutes to kill in between meetings or maybe with your dentist or the doctor’s office or whatever, and so you can start training this cub to do things. So, in this case I’m going to actually figure out, you know, maybe make this cub do some backflips, or well, yeah, a backflip is good. So, it actually has all these different tutorials, you can play catch, you can pet, you can do all these kind of thing, and the cub actually gets smarter over time. Ina Fried: And now, can you transfer the interactions and the value, whatever leader points you get, from that back to the console version of Kinectimals? Derek: Yeah, so what we have is, you know, we don’t actually look at these applications with these games in this case as silos. They are all tied to my Xbox Live ID. I get gamer points, I get achievements, I can compare with my friends. And as you’ll see in a moment, we can actually take the work that I’m doing here, and bring it over to the console. So one of the things that we also want to do, of course, is make this really easy so that I can, you know, try out Walt for size, see what Walt’s up to. Maybe I actually want to use my camera. And so it takes advantage of unique features of the phone. So, actually, you know what? Can you help me out by just holding out your hands like this? Actually just pivot, yeah, that’s perfect. So we’re going to, we’re going to see how Walt looks with Ina. Okay, so I’ve got my camera here, I’m going to go ahead and take a picture. Fantastic, we got stage lighting, that’s perfect. I’m going to go ahead and accept this photo. And what we’ll actually do is process the picture, and indeed I can actually take little Walt here, and actually pop over, spin in 3-D, get the tilt just right, and just like that we’ve got you with Walt. I can share that up to Facebook. I’ll choose not to do that for many reasons right now. [laughs] And so we got all of that right here. So that’s just an example of how we again use the unique features of the phone, in this case, to have photos and things like that. So, it’s really easy for people to take photos, share them with their friends, and experience this in a new way. Now the final thing we want to do is of course customize this a little bit. And so one of the things that we’ll do is we can actually go in and find all sorts of things to add. So we’ve got shopping experience, we’ve got bars, drink, foods. I’m going to actually do two things, I’m going to buy a collar, ’cause I want this to be really distinctive. So, I’m thinking the pink chain collar is going to look fantastic. Ina Fried: I’m sure Walt loves that. Derek: Yeah, it looks really good. And so that’s one. Okay, and now I’m going to actually go over and grab a pendant as well, and I think rubber duck, what do you think? So we’ll add the pendant, we’ve got that. Now what we want to do is actually take this over to the console. And so, what I’m going to do, is actually load this up and I’m going to actually export this to the console. So, I’m going to take this and I’m going to choose Xbox 360 Transfer. And I’ve got two options here, I can transfer from or I transfer to. Ina Fried: So here you’re taking it from the phone and putting it on the console. Derek: And what ends up happening is it actually takes all the information associated with this cub in this case, and puts it into a tag. And so now if I go ahead and switch over to the Xbox console, we can go ahead and switch the screen. Great. We’ve actually got Kinect up and running here, and we have this picture of the Kinect app, that’s called the scanstone. And so I’m going to go ahead and actually select my scanstone here. Which is a place where I can actually import stuff. [game plays] So I’m going to go ahead and take that, hold that up. And then instantly, our favorite cub Walt actually appears, complete with the pendant and the collar and all that stuff. So it’s really easy to move this stuff back and forth. Andy Lees: So what we’re, what we’re seeing here is how, you know, people’s lives will include multiple different devices. And so, enabling them to, you know, spend time on Xbox, have a companion on the phone, so, so far the Xbox Live has been making the phone better, but now the phone is actually going to make Xbox better. And the same is true with how we work with the PC and tablets, etc. Ina Fried: And you mention the PC and tablets, and one of the things that Microsoft has done that’s a little different, when you look at your nearest competitors, both Apple and Google have said the phone and the tablet are similar, but they’re different than the computer. So they have one mobile operating system that powers their phone and their tablets, and then a desktop operating system that powers their notebooks and desktops. Microsoft’s taken a different approach. You guys say the phone is different, and you have one operating system, Mango, Windows Phone 7, for the phone, and then you’re saying Windows is the right operating system for tablets and computers. Why is that? Andy Lees: Well, first of all, we believe that everything that you want to do on a PC you should be able to do on a tablet. Particularly given people often dock tablets, they may want to connect to the keyboard, they may want to connect up a mouse, if they want to use touch on a PC. They should be able to go backwards and forwards. And that’s some of the work that we’re doing in Windows 8, which was announced at the Build Conference. We will share more technology between the PC and the phone over time. Ina Fried: ’Cause right now you can’t write one application and have it run on the phone and the tablet and the PC without doing a fair bit of work. Andy Lees: Actually, you don’t need to do much work. What we did is we built the developer tools and you can take a huge chunk of the code that you have written, and what you do is you just make changes to the user interface. And depending on how you’ve written it, then you can take up to 80, sometimes 90 percent of the code across with you, so all your logic and things are kept with you. But you want to celebrate what’s unique about the user interface. So, we demoed, for example, at the Build Conference an application that actually started out as a web application for Silverlight. They then made some modifications, they modified the code onstage, and there’s like three or five lines of code. And made it into a full-blown Windows 8 application. And then they took the same application and made a small number of changes to the user experience, the UI, and then just took that code and ran it on the phone. So, sharing components, you know like the browser that Derek talked about, enables us to get the best of all worlds. Ina Fried: Now that’s the software piece. And I want to talk a little bit about the hardware makers, because unlike Apple and more like Google, you guys have an approach where you don’t make your own hardware, you rely on HTC and Samsung and now Nokia, and other partners, to make the hardware. Historically, or history, as much history as there is in a year, in this first year, I would say it’s fair to say that you guys have not gotten the latest and greatest when it comes to hardware, from the device makers. Is that changing? What does Microsoft have to do to make sure you’re getting the latest and greatest screens from Samsung, processors from Qualcomm, etc.? Andy Lees: Right. Well, obviously in our view on — one of the things that we wanted to do was to stop problems like fragmentation. And so, we locked a lot of things down, and then we’ve been building an architecture that allows the hardware manufacturers and software vendors and in some cases mobile operators, to all add their value, but not in a way that’s chaotic. And when we do that, and the way we’ve architected it, allows us to leapfrog our competitors. An example of that is, you know, how we do hardware acceleration of the browser. We put some building blocks in there and no matter which phone that you choose, whether it’s a low cost phone or an expensive phone, it all works in a consistent way. So, we have these things called chassis in this architecture to do that. So we allow the OEMs and increasingly Mango allows that, and some things we’ll do in 2012 will extend that further, to enable us to leapfrog. So let me show you an example. So, I have a couple of phones here that are quite different in terms of how they look, the style of them, the specifications of them. Ina Fried: And these are new Mango phones. Andy Lees: These are new Mango phones. They have very different price points that they are available for. And yet the user experience, they both will run the Xbox game that you’ve just seen, so they’ll both be able to do high end graphics, but the performance that you get is very consistent as to how they work. But doing this in a way that still allows the OEMs to differentiate is really the secret source. So, we don’t have the downside of the chaos that can often, and the fragmentation that can appear in other platforms. Ina Fried: Now, in your right hand is the Samsung Focus S, I believe. Ina Fried: And that is, you know, a higher-end phone. Do you think that when consumers walk into the store, that phone that’s in your hand is going to stack up against the iPhone 4S, the Galaxy Nexus that Andy Ruben showed last night? Andy Lees: Absolutely. And I think we’ll have a range of phones because the user experience that we have from the cheapest phones through to the most expensive phones with high end cameras, super bright screens, lots of memory, and all of the other options that you would want, front-facing camera, etc. So we’re enabling that through architecture, so that they get to do all of that differentiation and that enables us to get the best of both worlds. Ina Fried: I definitely want to get to folks’ questions, but I have one or two more things to question you about. One is, you know, Nokia. They’re obviously, I think you guys have said, your most important partner. They’re the only hardware maker that’s devoted to you guys. I mean, they’re still going to do some of their own stuff, especially at the low end, but unlike, from what I recall, every other Windows phone maker, they’re not also making Android devices. Ina Fried: You know, we’ve heard this year, we haven’t seen anything yet. How important is what they’re doing? And how quickly is it going to come on? Andy Lees: Well, you have to wait just one more week, because next week Nokia, at Nokia World, are going to be announcing their plans to roll out Windows Phones, amongst other things. And so, we’re very excited for them to be in the market. Certainly they have a lot of resources in many parts of the world, that’ll be a huge accelerant to us. We’re very excited in fact that they’ve chosen, they did an evaluation when they were looking at their future strategy, as to whether they should go Android, or whether they should go Windows Phone or a mixture. They saw our roadmap both for this year and for next year, and I’m assuming that they saw the roadmap for Android and they talked about how the products are going to come together, and they decided to bet the whole company on Windows Phone based on that. So, we’re very excited about that. And we also, seeing from the other hardware makers, that they see that as an accelerant, we’re not buying their competitor or anything. So, as a result, that really allows us to partner with other OEMs, which helps Nokia in turn, but makes a more vibrant ecosystem. Ina Fried: Last night, Andy Rubin’s pitch to the hardware makers, that he made, you know, via the stage, was basically that you guys aren’t allowing enough customization. That there just isn’t enough room to really shine as a computer maker, as a phone maker, as a device maker. What do you, what do you feel like allows Windows Phone makers to make their phones unique? I mean, I see different hardware sizes, but I actually don’t see a lot that makes that HTC phone look different from that Samsung phone. Andy Lees: Well, so, and there are different things that you can do in hardware and software. So, for example, if one phone wanted to be NFC and the other one didn’t, you can do that. Different cameras, etc. What we do is we allow OEMs to add, but not replace. And we provide a core set of experiences and a platform within which they can replace, they can extend. And that’s a far better methodology than having people ripping out parts of the system to improve upon them, because then what happens is you get fragmentation. So, I think that when you see this in the store, you will see a whole bunch of unique software and some unique hardware features that HTC has versus the Samsung, and vice versa. And next week, when you see the announcements from Nokia, you will see them doing the same things. They’ll have differentiating hardware and software. So that’s not a limitation. I think the biggest issue is the fragmentation that their model provides. Ina Fried: And you guys are obviously making the case to your hardware partners that, “Hey, Google’s going out and buying one of your competitors,” do you think that change in the market is going to get any of them to drop Android? Or are you just looking for more of their time and attention and resources within those same hardware makers? Andy Lees: We’re not forcing anybody to drop anything. Certainly, we’ve seen a lot more motivation from hardware manufacturers since Google made that announcement. I think they’re very nervous about what’s going to happen. And I’m looking forward to making a few announcements of some new OEMs that are coming on board. And I think some of that was motivated by what they see in terms of the pace and the innovation we put in the software. Some of that they see because of the investment that Nokia is, is putting in place. And some of it, frankly, is also because of what Google is doing. Q: So, the question I have is Andy Rubin last night mentioned a hope for a patent piece, particularly in this smartphone market. And from all appearances, Microsoft doesn’t seem to be very interested in that goal. Case in point is, you know, by making up for it, perhaps a deficiency in sales, you know, Microsoft is now extracting value from the Android environment through patent licensing. So, my question is, you know, is Microsoft, does Microsoft see any interest in moving towards, to this patent piece, or whatever kind of model that Andy had mentioned because this isn’t an issue just for Google. It’s a major issue for patents, or major issue for small and medium businesses. So, you know, where does Microsoft stand? Ina Fried: So patent piece, you guys are fine with patent piece as long as people pay you for piece, right? Andy Lees: Well, no, here’s what’s important, is if you are a software based business, you need to be able to protect your intellectual property. And there’s two mechanisms to do that. One is through patents and another one is through copyright. If something infringes on your patents, then it’s much easier to copy something than it is to invent it for the first time. That’s what patents are really about. So, we, Android reads on a whole bunch of patents that we own, inventions that we made, and so as a result, our philosophy here is, we’re not trying to stop Android, we just want to make sure that the principle of protecting intellectual property, which enables all software businesses, it means that you don’t have to be an advertising business that gives software away in order to make money. You’re allowed to be just a software business. So what we do is we have a licensing program for the patents. And that way, if somebody decides to go and to use the patents, we enable that and let them pay for it. It’s critically important for businesses like ourselves, that want to be a software business, and want to make money from selling software, that you can protect your intellectual property. Ina Fried: And you guys have gotten patent deals at this point with Samsung and HTC, both of which are paying you a royalty for every Android device they ship. You’re not, you’re not in charge of the patent P&L, you’re in charge of the Windows Phone P&L. How much does it bother you that Microsoft right now is making more money from selling Android phones than they are from selling Windows Phones? Andy Lees: Well, you know, the, what’s important here, as I said, is to have the principle that the patents that people own, through the inventions that they provide, are protectable, and that they get a level of return for those inventions. And that’s certainly what we are doing. We’re not here to stop competition in any way, shape or form. And we want to enable people, and that’s why we have a licensing program. Ina Fried: But it’s got to be your goal, at some point, that Microsoft makes more money off selling its own phone software than off licensing the patents to a rival. Andy Lees: Yeah, I don’t know where the, you know, one making more money than the other comes from. We certainly want to sell a lot of Windows Phone. Ina Fried: When, speaking of that, when we get back a year from now, what would it look like? What does success look like for you? What does it mean when you say, “This is the year we want to gain scale”? What does that look like? 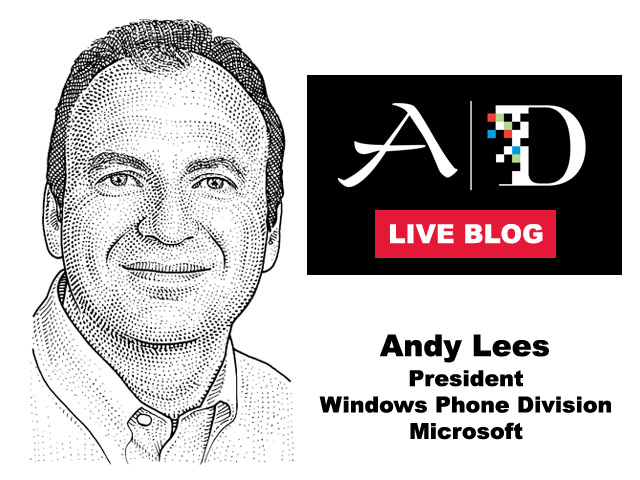 Andy Lees: It looks like, as gaining market share in terms of overall unit volume, we’re starting to see partners come on stream and to bet more aggressively using Windows Phone as a foundation of their products. Like, you know, the number of portfolio products that somebody like Samsung, HTC, the number of products that Nokia brings to market, to satisfy the broadest possible set of users. We want very high satisfaction ratings with our end users, and we want developers to have a thriving ecosystem. Ina Fried: So if you gain a point or two of market share a year from now, are you happy? Or do you really see this a year that you guys can gain significant percentages of market share? Andy Lees: Well, we’re not allowed to provide forward predictions, but certainly our goal is to gain market share over the next 12 and 24 months. Ina Fried: Significant market share? Ina Fried: All right. Other questions for Andy? Be thinking of them. I’ll ask a couple more, but I’d love to hear from all of you, what you would like to see from Microsoft in the phone market. When you look at what the most significant things that are coming into the phones. I mean, one of the things you guys said, when you sort of laid out the roadmap for Windows Phone was, these are going to have the power that your PC or your Xbox had a couple years ago. And built Windows Phone Mango to look like what you could do from that. What are the things that are going to come into the phone capability-wise over the next year or two, that we can’t do with our phones today? Andy Lees: Well, you know, we see this, what we would call the point of convergence, because the technology in the middle of the phone is not two years behind the PC, it’s the same thing. It’s the same thing. And in fact, enabling that technologically is very important, so the compute power that’s on tap, the connectivity on tap, enables all sorts of different scenarios. The thing that’s also interesting about the phone is the utilization of sensors to provide location, so that you can find out about the world around you — new sensors so that you can use things like augmented reality, through vision and sound — will enable all sorts of new scenarios. And this is where the hardware and the software and the cloud really work together, in really a unique way. And so, for example, on Mango, as you’ve seen, you know, you can start asking it questions about the world around you, you can say, “I want to go for a movie” and then you find out what movies are available, where they are near you, and then you want to find a restaurant near you. So. Ina Fried: Yeah, I’ve been hearing a lot about this, talking to your phone thing. Is that going to be big? Andy Lees: Well, certainly you can talk to your Windows Phone in Mango. We hooked that up into Bing, and so as a result you get the full power of the Internet to answer your questions, not just a limited set of services. I don’t know if it’s going to be the major source of input. There’s the whole social element of what it’s like to be talking out loud to your phone. I think it’s useful in some scenarios, in cars, it can be very useful for you to be able to talk to your phone, and it talk back to you in that way. So, not all the time, but sometimes it can be very useful. Ina Fried: What about payments? We haven’t heard a lot from Microsoft, we hear Google with NFC and Google Wallet. We hear a fair amount about this idea of payments coming to the phone. Where does Microsoft see its role in terms of that? Andy Lees: Well, we’ll provide the technological building blocks so that payments can easily be done on the phone. We’re not trying to compete with other people that want to provide services on that, so we will have a platform approach rather than necessarily trying to own all of the transactions. Ina Fried: NFC’s one technology, but it does still strike me that it’s the case that, you know, if there’s a new acronym to come, whether it’s NFC, LTE, all these acronyms come first to the other platforms. Is that by design? Will that start to change? Do you want to be seen as the first phone maker to bring X hardware innovation? Andy Lees: Yes, we do. And I think we do that via architecting, to be able to leapfrog. So, we’re putting the right pieces in place, that enable the manufacturers as described before, to start adding their own hardware support by using device drivers, in much the same way as we have done on the PC. The PC has introduced all sorts of innovations, first through an architecture of extensibility, and we’re bringing that to the phone. Q: So, there is a whole lot of content, ecosystem built around — and yesterday, Andy also talked about that that is the critical reason that their tablets probably — how do you see forward – – shipment? Is there anything that you’re doing special and going forward, content market, especially consuming through Windows Phones? And how will you look at content partnerships on Windows platform? Ina Fried: So on the content side, you guys have generally gone with the, you know, a la carte model on video, and you’ve gone with the subscription or a la carte model on music. So, there’s a Zune pass for those of you who aren’t as familiar. I don’t think it’s in every geography, but at least in many, where you can have a music subscription on the video side, at least from Microsoft directly, it’s an a la carte. Is that enough on the content side? Are you guys keeping up? Do you want to let partners do some of that? Obviously Netflix, that kind of thing. Andy Lees: Yeah, we’ve been lucky to have, you know, Netflix was first on Windows Phone, versus other platforms. Having a consistent and predictable target is really very useful for people providing content. Because you don’t want to have to relay out things for different form factors. So, content is important. I think that what we’re doing with music and video is a la carte, we’re working through partnerships to be able to provide those things. We do provide the music service ourselves, and we’re expanding the geographic footprint that that’s available in, with Mango, and we’ll continue to do that into the future. Of course, on the Xbox, we’ve just announced a whole bunch of new partnerships, to bring more video and TV and movies, etc. And having that as part of the Microsoft fold does enable us to, you know, work with those partners to bring them across all of the different clients that we would have on different form factors.